A network of spinal nerves that originates in the back of the neck, extends through the axilla (armpit), and gives rise to nerves to the upper limb. 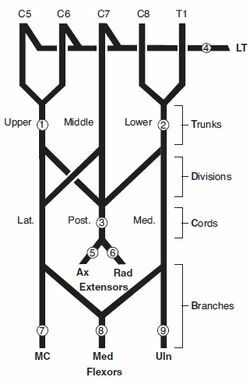 The brachial plexus is formed by the union of portions of the 5th through 8th cervical nerves (C5-C8) and the first thoracic nerve (T1), all of which come from the spinal cord. The plexus consists of roots, trunks, divisions, cords and branches. The roots lie between the anterior and middle scalene muscles. The trunks traverse the posterior triangle of the neck. The divisions lie behind the clavicle. The cords lie in the axilla. Postfixed: Contribution by T1 is large, T2 is always present, C4 is absent and C5 is reduced in size. d. Cords: These 6 divisions will regroup to become the 3 cords. 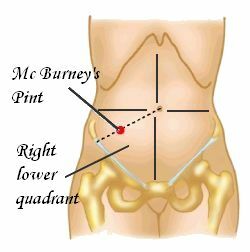 The cords are named by their position with respect to the axillary artery. 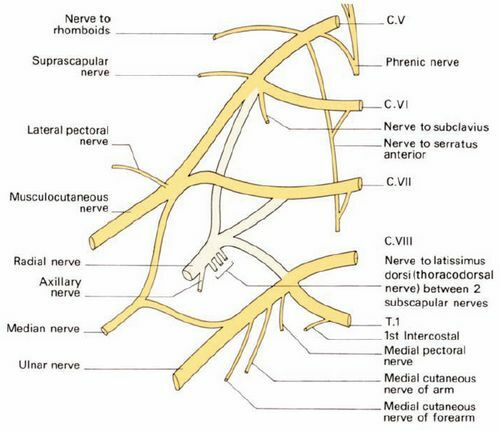 Suprascapular nerve from the upper trunk (supplies supraspinatusand infraspinatus) – C5 and C6. Note that the posterior cord supplies the skin and muscles of the posterior aspect of the limb whereas the anteriorly placed lateral and medial cords supply the anterior compartment structures. It may be damaged in open, closed or obstetrical injuries, be pressed uponby a cervical rib or be involved in tumour. It is encountered, and hence putin danger, in operations upon the root of the neck. 4. 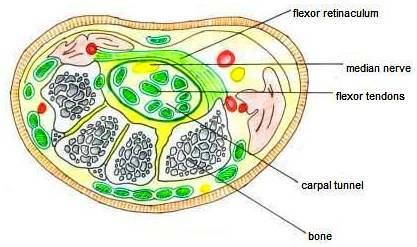 Neurapraxia or stretch: the nerve has been damaged but not torn. 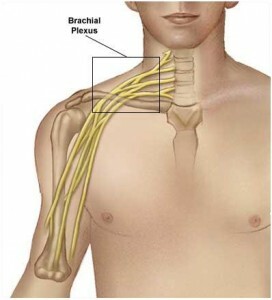 Neurapraxia is the most common type of brachial plexus injury. Muscles paralysed: Mainly biceps, deltoid, brachialis and brachioradials. Partly supraspinatus, infraspinatus and supinator. 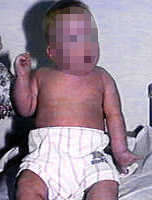 Deformity (Position of the limb): The deformity is known as ‘policeman’s tip hand’ or ‘porter’s tip hand’. d. Sensations are lost over a small area over the lower part of deltoid. Cause of injury: Undue abduction of the arm, as in clutching something with hands after a fall from a height, or sometimes in birth injury. a. Intrinsic muscle of the hand (T1). b. Ulnar flexors of the wrist and fingers (C8). a. Claw hand due to the unopposed action of the long flexors and extensors of the fingers. b. In a claw hand there is hyperextension and the metacarpopharyngeal joints and flexion at the interphalangeal joints. Cutaneous anaesthesia and analgesia in a narrow zone along the ulnar border of the forearm and hand. 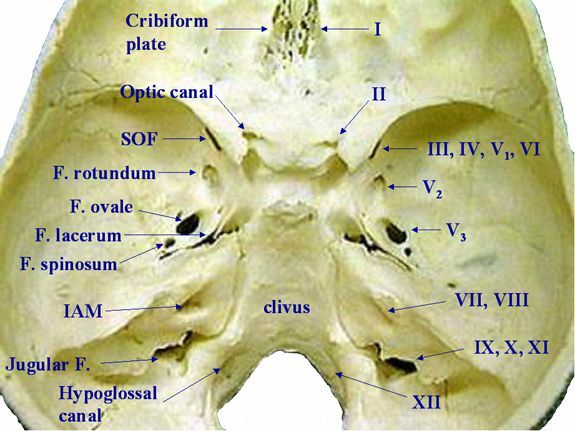 Horner’s syndrome: ptosis, mitosis, anhydrosis, enopthalmos, and loss of ciliospinal reflex- may be associated. 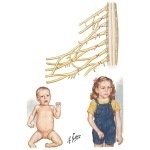 This is because of injury to sympathetic fibers to the head and neck that leave the spinal cord through nerve T1. Vasomotor changes: The skin areas with sensory loss is warmer due to arteriolar dilation. 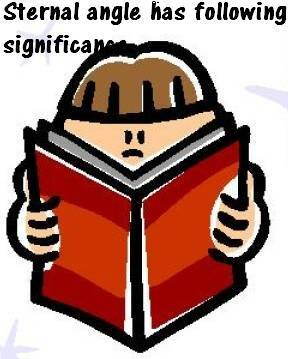 It is also due to the absence of sweating as there is loss of symphatetic activity. Trophic changes: Long-standing case of paralysis leads to dry and scaly skin. The nails crack asily with atrophy of the pulp of fingers. a. Sudden pressure on the shoulder from above. b. Carrying heavy loads on the shoulder. a. Winging of the scapula i.e. excessive prominence of the medial border of the scapula. b. The pull of the muscle keeps the medial border agains thoracic wall. a. Loss of pushing and punching actions. During attempts and pushing, there occurs winging of the scapula. b. Arm cannot be raised beyond 90° i.e. overhead abduction which is performed by the serratus anterior is not possible). b. All muscles supplied by the median nerve, except those of the hand. b. Loss of flexion of forearm. c. Loss of flexion of the wrist. d. Sensory loss on the radial sode of the forearm. e. Vasomotor and trophic changes as above. It is a syndrome characterized by the compression of the median nerve as it passes beneath the flexor retinaculum in carpal tunnel. Pain, numbness, and tingling in the fingers are all symptoms of carpal tunnel syndrome. Seeking medical treatment quickly could mean the difference between medications and surgery. If you’re having pain any of these carpal tunnel syndrome symtomps you should take action right away before it’s too late. A new keyboard or chair might let you live longer! i have a bracial plexus injury to my left arm arising from a motorcycle accident in 1997,i have not had any surgery and have had severe pain for 3 years after the accident but i don’t take any medication and only have a mild pain constantly,the extreme pain subsided,i have no use of any part of my left arm,but i do have sensation to my elbow,its a terrible injury,is there any new technology in surgery to repair any of the arms movement these days?any help would be great. Your story is similar to mine, I also had my accident in 1997 but mines the right arm, I lost complete use of it and have feeling to my elbow just like you, but the big difference is that my pain never went away, I wish mine had subsided like yours did after 3 years but unfortunately it’s always there, I take heavy pain meds to help control it but there are days when even all the pain meds in the world wont even put a dent in it, thankfully it only gets that bad a few times a year. If anyone knows of any new treatments I’d really like to hear about it. Hi… very informative… my new born baby has Erb’s Palsy and Klumpke’s Paralysis symptons… can u pls gimme more info on this… will my baby recover and what treatment should I consider… also how long will it take for her to recover. Great article. Concise and accurate. Great article am so glad that I found it. I am 34 and have had this now for about a month it’s June 2015 I have all above symptoms but have to say that the pain I’m in is horrible the worse I have ever been in and I have been through a spinal cord injury which I had major surgery back in 2008 which after i had to learn to walk again it was on my lower spine L3 and l4.because of this i have a condition called caude equine syndrome_”type of cronic pain” so I am already on a lot of medication for this type of nerve injury so nothing is working have not slept anyway I hope that the pain will ease up soon or I will go insane.